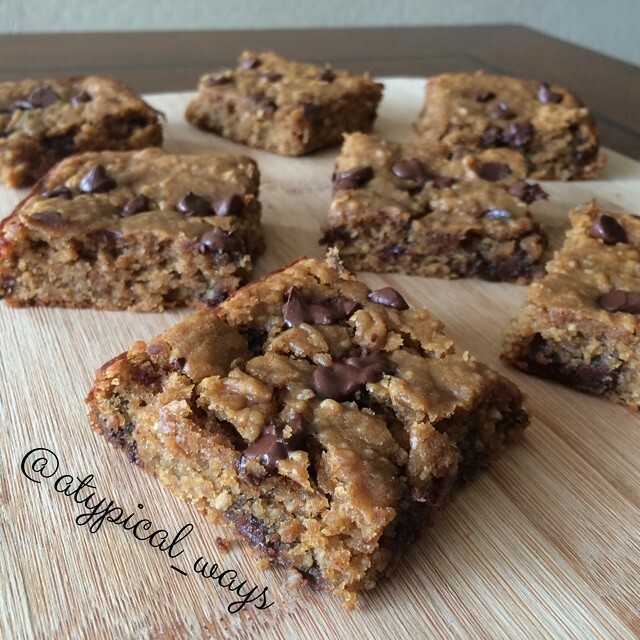 Gluten Free Peanut Butter & Chocolate Chip PROTEIN Blondies – no beans! Gluten Free Peanut Butter & Chocolate Chip PROTEIN Blondies with only 5tbsp’s of gluten free oat flour & no beans! Did I mention, kid approved! Preheat oven to 350 degrees and line an 8×8 baking dish with parchment paper. Don’t attempt to make this without the parchment paper. It WILL STICK even with cooking spray, ask me how I know! In a medium size bowl add the oat flour, protein powder, baking powder, baking soda and then set aside. In a large bowl combine the sugar, peanut butter, vanilla, agave and applesauce. Beat wet mixture using a hand mixer. I originally tried doing this with a spoon and it just wasn’t working. The hand mixer was perfect! After the mixture is smooth add the egg and beat lightly until combined. Add the wet mixture into the oat mixture and stir just until combined making sure not to over mix. Fold in all but a small handful of the chocolate chips and pour into the pan with parchment paper. Top with the remaining chocolate chips and bake about 20 minutes making sure not to over cook. I took mine out at 20 minutes and they were perfectly cakey! « Mini Chocolate Chip Cannoli cups with only 250 calories for all 4!